Who doesn’t love cozying up to a glowing fire with a good book in the evening or sitting fireside for game night with family and friends? We sure do! And that’s why it’s time to market this great feature to interested fall and winter buyers. An appealing and comfortable living space is a high selling point for any home and usually near the top of most buyers’ wish lists. It truly is the hearth (heart!) of the home. As stagers, we consider the fireplace to be the architectural feature of the room and an important focus of our styling, creating a sense of warmth and welcome to guests (buyers). 1) First - declutter your fireplace area – you don’t want it to feel overcrowded with clutter or functional items. Let’s see that great focal area! 2) Next, depersonalize the space – (i.e. – removing picture frames, awards/trophies, or any personal items). 3) Balance – you want your mantel décor to be balanced with the room and create an overall feel of symmetry in terms of style and palette. 4) Add some color to the mantel and hearth – it’s a great place to add a pop of color to draw attention to the room’s feature, especially in neutral colored living spaces. This can be done through artwork or colorful accessories such as vases or pillows. Color draws buyers into the space and encourages lingering. 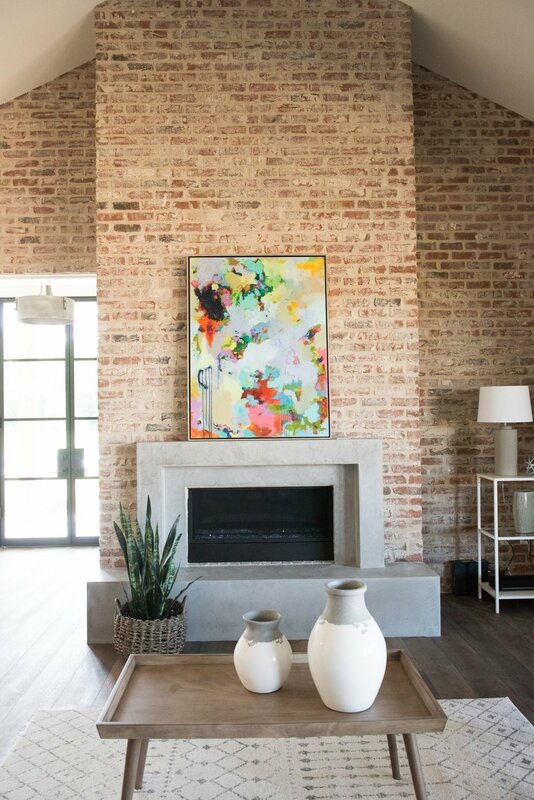 5) When choosing artwork as a focal point, choose artwork that will appeal to various buyers’ taste. We prefer simple neutrals and abstracts. Detailed art requires too much interpretation and doesn’t translate well in photos. And please, NO mirrors! 6) Don’t overcrowd the mantel or fill both sides of the mantel with arrangements/candles. A tall vase with artificial greens or neutral candle sticks + a large piece of vibrant artwork is simple and sweet and sure gets the job done. 7) Don’t worry about nailing art to the wall especially if it’s brick – leaning artwork against the wall and resting on the mantel is perfectly fine and adds some fun detail! 8) Some fireplaces can appear dull and dreary when empty – a simple solution to avoid the “black hole” is to add candles or birch logs to cheer up the inside. 9) Make sure to "sell" a wood-burning fireplace by removing free-standing screens, cleaning out the ashes, freshening the interior with a coat of Rustoleum Heat/Fire Safe black spray paint and placing a few logs on the grate - ready for warmth and appeal! We’ve included some sample images to help you create the perfect mantel space! Happy Staging! Laundry rooms should make you smile! Doesn't the smell of fresh clean sheets and towels bring a smile to everyone’s face?! We've come up with a cheat sheet that’s sure to make potential buyers actually get excited about doing laundry in your laundry room…. "Old ways don't open new doors"
The foyer of your home, whether large or small, should be functional and beautiful. After all, it’s the first glimpse of your home! Does it set the tone for your home’s interior? Is it a snapshot of what’s to come? Does it exude a warm welcome? Is it decluttered and clean? 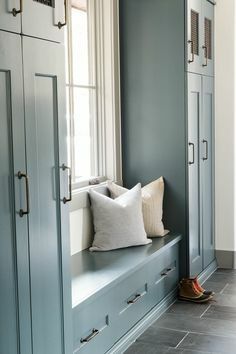 a small bench with pillows is great for a small foyer/entryway or to create a foyer “feel” if you don't have one at all!